Tom Hunter’s West Coast Capital (WCC) has agreed a joint venture with Cala Homes to help create a £1 billion housing and schools development — involving 3,450 new homes — at Winchburgh in West Lothian, just west of Edinburgh Airport. The development is one of the UK’s biggest housing-linked infrastructure projects and will generate up to £1 billion of value to the local economy over 15 to 20 years. As well as the new homes and associated infrastructure, West Lothian Council will build a number of new state-of-the-art schools. Finance Secretary Derek Mackay said: “As we support the continued growth of the Scottish economy, developments like Winchburgh are crucial. “I am pleased the Building Scotland Fund, has been able to support this development; to unlock the construction of 3,450 new homes and the infrastructure required to make Winchburgh a reality. “The Winchburgh development is a leading example of a joined up approach between the private sector, government and local council. “It will help stimulate the economy and bring new homes, schools, transport and community facilities to the area. West Lothian’s executive councillor for education, David Dodds, added: “We are delighted to have reached a deal with the Scottish Government and Winchburgh Development Ltd that supports the plans to expand Winchburgh. “Key to the development is the delivery of new state-of-the-art schools for Winchburgh in the council’s largest ever single capital investment. Tom Hunter, founding partner, WCC, paid tribute to the Scottish Government and West Lothian Council for their support for the development: “Both West Lothian Council and the Scottish Government have played a critical role in securing this long-term development for Scotland. Phase One of the Winchburgh plan saw five private housebuilders — Barratt Homes, Miller Homes, Bellway, Stewart Milne Homes and Taylor Wimpey — active on site, with the expectation that many more will participate in the ongoing development. Cala CEO Kevin Whitaker said: “We are delighted to be partnering with West Coast Capital to help fund and deliver a high quality, sustainable development that will bring multi-tenure housing, education and infrastructure to West Lothian. “Following the acquisition of Cala by Legal & General last year, we have the appetite, expertise and capability to work on ambitious large-scale projects such as Winchburgh. “West Coast Capital has worked incredibly hard over the last eight years to bring the site to this advanced stage. John Hamilton, CEO, Winchburgh Developments Limited, said: “It’s a huge achievement for all parties involved to have reached this point where the plans we have made can start to become a reality. 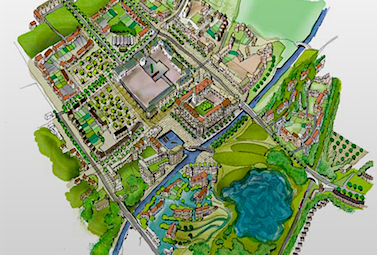 “The masterplan for Winchburgh goes far beyond building new homes.